Neighbor Julia: Shutterfly Christmas Cards! So I know that I just did a post about Shutterfly and a few other online photo printing companies, and I was planning on doing a blog post about hot chocolate today, BUT the Shutterfly Christmas Cards were brought to my attention! So, we will have to talk about hot chocolate tomorrow! This year they have some really cute new cards to choose from! My favorite can be seen at the top of this post or click here to read about it on Shutterfly! Shutterfly has a wide variety of folded cards, stationary cards and photo cards. The prices ranged from around 40 cents for the photo cards up to 1.50 for the folded cards! Each card comes with an envelope for that price and the folded cards have many inside formats that allow you to have your family newsletter printed right on the card! Search through all of the Shutterfly Christmas Cards! I really like that many of their cards have space for multiple pictures! 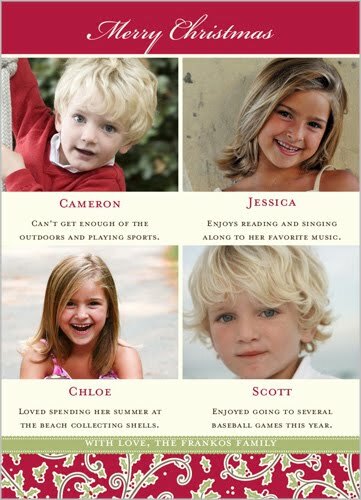 Like this card to the right would be perfect if you have two sets of identical twins like this family! But seriously, a lot of times I have a traditional family picture for the Christmas card but I also have a lot of cute candid photos of the girls and I'm always torn between which I want to use on the card! This way you can have some of both! Plus, their website is really easy to use which is great because I'm a little technologically challenged! You can also order 1 free card of your choice to see how it is going to look before you order 15 dozen to send out to all your cousins and whatnot! Right now they have a few different deals on these super cute cards! And even though I only included a few in my blog there are dozens of choices and formats! If you order by Nov. 17th you can get 20% off your order. They also have a free shipping promotion if you order 30 dollars worth of stuff from their website. Also check out Shutterfly's wall calendars which are currently buy one get one 50% off! They make awesome Christmas presents (especially for all those Grandparent type people on your list!) And if you are a blogger like me (or even if you are a blogger that is not like me) check out the following link to find out how you can receive 50 free Christmas cards! 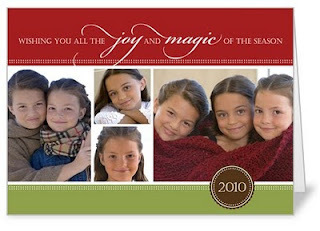 http://blog.shutterfly.com/5358/holiday2010-blog-submission-form/. Merry Christmas card shopping to all and to all a good buy!